Walks in Spain have taken the best walking stages, the most famous sights and monuments and the best accommodation to offer you a unique way of doing the Camino in style. 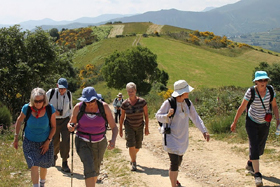 For this 8 day tour we have chosen the best bits of the last 300km of the Camino offering you the choice to walk as far as you feel comfortable each day with the support of the Mercedes minibuses for when you have walked enough. Staying in the best accommodation, you will be doing the Camino in style yet this holiday is great value compared to other companies that offer poorer accommodation and charge more. The tours are led by Paul Jr and Paul Sr, father and son team and owners of Walks in Spain. If you are looking for a Camino tour that is flexible to suit your walking requirements, start any day of the week and for as many days as you choose and still stay at all the best places then this is the tour for you. Our Camino self guided tours are designed to your requirements and not an off the shelf package. They are affordably priced without compromising on the quality and service you would expect from a bespoke tour operator. We recognize that the Camino is a magical experience and with our expert knowledge and organization we will make it special for you. Our self guided tours are aimed at couples, small groups and solo travelers. Don’t just take our word for it! 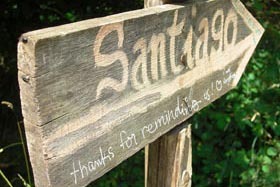 See what our self guided Camino walkers have to say!